IPCC's High-impact, low-probability risk media talking points | Watts Up With That? It’s one thing to terrify the populace with apocalyptic rhetoric and images of collapsing ice sheets or tsunamis. It’s quite another to gain ratification of a treaty obligation imposing huge costs on both the future economy and the individual voters. The 2015 COP in Paris is scheduled to finalise a climate change treaty which imposes CO2-mitigation obligations on all 194 member countries. Members have four years to ratify the whole agreement before it supposedly comes into force in 2020. The process has many aspects of the prisoner’s dilemma, in that no country will want to ratify unless it believes others will do likewise. Nobody believes the majority will sign up in the absence of a benefit-cost analysis which can at least make sense to an alarmist. These analyses are undertaken in economic models, which ascertain the present value of net impacts of expected temperatures, determined by climate models that are driven by CO2-e concentrations and sensitivities. The impacts will be taken from AR5 WG2 which should reflect the basic science in the WG1 draft released this week. The prognosis for alarmists is not good. 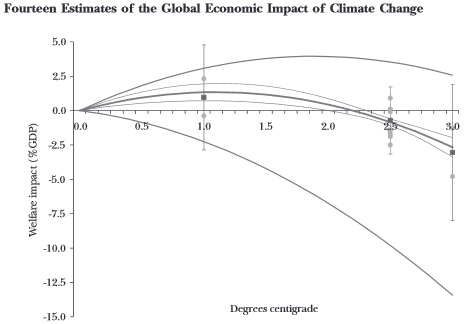 Richard Tol’s literature survey produced a well-known graph of 14 estimates of the global economic impact of climate change, expressed as the welfare-equivalent income gain or loss. This graph shows that net damages from warming don’t accrue until temperatures increase about 2.2°C from 2009, or 3°C from the usual 1850 baseline. However, after a very benign start, it is true that incremental welfare losses do begin to appear after temperatures have risen about 2°C from 1850 levels. Tol’s graph accounts for the 2°C upper limit adopted by the G8, which was proposed to the UNFCCC at Copenhagen, and adopted at Cancun (2010; COP16). However, that 2°C target is becoming further and further out of reach. No progress at all has been made in the past 17 years and these doldrums may continue indefinitely. The SREX report has knocked over swathes of impact possibilities. And now there’s an inescapable need to reduce ECS by half, or at least a third! This was a terribly dispiriting outlook for the climate industry – so it was essential that AR5 pull something out of the hat. One area had potential for improvement. The “tipping point” or “irreversible” events that all previous reports had treated as too far-fetched to warrant much attention could be added into impact valuations if they were accorded a percentage probability. Insurance underwriters suggested “high-impact, low-probability risks” (eg http://eprints.lse.ac.uk/37612) might supply the best hope to justify imposition of an expensive premium payment under a global risk management plan. Here we see a familiar list – collapse of ice-sheets, release of permafrost and clathrate methane, forest die-back and loss of monsoons. Sure they have low probabilities and varying confidence levels, but the impacts will run to trillions of dollars. Even 5% of one of these events is a very large number. A great deal depends upon whether the probabilities are temperature-factored. 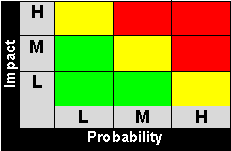 If, for example, monsoonal collapse is included as a small risk from a low threshhold temperature, it might avoid much of the time-discounting effect. This could make it a major NPV player in future economic models. Such prospects explain why Table 12.4 held such an important place in the agenda of the Royal Society meeting. There is also a (weak) philosophical argument that irreversibilty should overcome the usual effect of time-discounting. No doubt this will be a topic addressed by Oxford moral philosopher, John Broome, who is to be a lead author of WG3. “A few decades” is apparently capable of relating to each phase in a long-term process, because, for example, it does not omit the near-complete disintegration of the Greenland ice sheet. “Or less” covers things that take place instantaneously. So the occurrence time element seems to be a red herring. The persistence time element won’t exclude much either, as the ‘commitment’ concept assumes the continuance of any damaging impact. “Large-scale change” only allows small regional effects to fall outside the ambit of the definition. 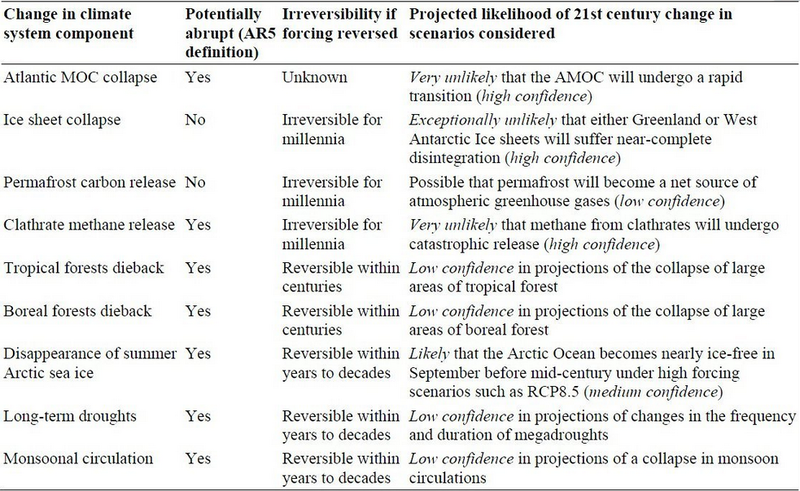 So, by and large, this Table 12.4 should include every expected large-scale change in the climate system that “causes substantial disruptions in human and natural systems”. If a feared impact is not mentioned in the table, it is reasonable to conclude that the IPCC does not expect that its “disruption” potential is “substantial”. ‘Abrupt climate change’, as defined, is a useful concept. Lukewarmers (the majority of skeptics) do not generally hold dogmatic views that anthropogenic global warming (AGW) could never cause small-scale or medium-term changes capable of causing minor disruptions in existing systems. Where they differ from the IPCC is in disagreeing that any such disruptions would be “substantial”. This is usually expressed by saying that skeptics don’t believe in catastrophic (CAGW) or dangerous (DAGW) warming. With the introduction of these innovative definitions, the lexicon can be re-framed. “Skeptics don’t accept that fossil fuel usage gives rise to any realistic or actionable threat of Abrupt Climate Change (ACC)” is a statement that even the mainstream media might come to understand. The items missing from Table 12.4 are like Sherlock Holmes’ “curious incident of the dog in the night-time”. They are not even “exceptionally unlikely” or “low confidence” possibilities. They just don’t exist as real threats. And the other good news is that every one of the “substantial disruption” possibilities are seen as “unlikely” by the IPCC except* Arctic Sea Ice melting. This is mainly positive in opening up new sea lanes – while albedo effects have low significance in a slow-warming world. So, now remind me: why do some see AGW as ‘the greatest moral challenge of our times’? Tol’s graph is the temperature increase from now; the G8 limit of 2°C is from pre-industrial levels, i.e., 0.7°C lower. I saw this earlier on the Katabasis entry on Bishop Hill. must admit I am somewhat agog that it was included. Pretty much every alarmist’s favorite catastrophe is included, and all but one basically discounted. I’m really looking forward to the usual suspects parsing this one. COP 2015 is scheduled for December 2-13. The unexamined yet overwhelming self-interest of the Planetary Saviors will be essential to maintain morale through the dark and cold weather. I’ve read a few of Richard Tol’s posts and they always leave me wondering if he is a CAGW mole! This stuff to many readers gives credence to the activist fantasy economic analyses. A journalist reading this would say “Prominent Skeptic Agrees Economic Meltdown to Appear After 2C Rise”. His overreaching, protesteth-too-much, obsessive articles and commmentary on Cook’s totally dismissible 97% thing did the same thing. Stop the activist literature searches already! it only gives their dreck more hits, creates internet discussion and encourages them more. You may only succeed in giving rabid CAGW an idea on how to be a mole. Yesterday I mentioned Bookies and the relation to Governments and Actuaries. And here we are. No need to employ competent actuaries or worry about taking the wrong bet on policy pricing if you can coerce governments to pay the insurance bills. And they say WE don’t understand risk assessment. Modelling the economic effects of modelled Climate change? There might be some room for error? Climate change is only then to be considered the greatest moral challenge of our times if we want to go ahead with Nuremberg style trials against the perpetrators and profiteers of the scam. I know this is a bit off topic, but on the sea ice page, there is one chart where the ice levels have fallen in the past few days. This has to be an error. It is the NORSEX SSM/I chart. I wonder what has gone wrong? And where, oh where, would all the money go? Who would actually benefit? I’m forever scratching my head over this, for in the end, after all the money is spent and the catastrophe happens anyway, we will be unable to adapt. We won’t be able to leave a legacy of any kind. No nineteenth century-style seawall eroding out of a Carolina sand dune, or anything like it. Of course, that assumes that this entire alarming scenario is ‘in the pipe’ to quote doomsday Jim Hansen. Funny, we don’t hear very much from him. Now that he’s out to pasture, he’s just another wacky catastrophist….. The good news is that by 2020, if the current halt continues, the entire gig will be up. There will be no one willing to spend a dime on saving us from the now obviously non-existant problem. @JimS That is a good but frightening graph. Dave re ice DMI is showing a much faster increase in ice extent than previous. It also has been stopped…. it happens everytime the ice scenario goes against the AGW meme ALWAYS you can check it out from previous postings here and elsewhere. Because we are consciously denying clean water and basic sanitation to 100’s of millions of the poorest peoples on the basis of this idiotic premise. This blog post, like virtually all other efforts dealing with “abrupt climate change”, conflates a geological catastrophe with a socioeconomic catastrophe. But a geological catastrophe does not necessarily a socioeconomic catastrophe make, unless society is immobilized, as noted in The Earth is Okay with a 400-Foot Sea-Level Rise (part of a 2008 web debate with Joe Romm and others hosted by Cato Unbound at http://www.cato-unbound.org/issues/august-2008/keeping-our-cool-what-do-about-global-warming). A much more detailed look at this matter is in this 2009 paper, Trapped Between the Falling Sky and the Rising Seas: The Imagined Terrors of the Impacts of Climate Change . BTW, I think DB is correct, the 2 degree target, which is a politics-, rather than a risk-based, target is measured off the “perfect” pre-industrial climate! Since, we are at either 15, 17, or 22 years with no temperature increase the first part of the above is satisfied as to a “large-scale change in the climate system” having happened. We only now must wait to see if the “persists” part is valid. However, some say we are headed down in temperature so the “(or is anticipated to persist)” might apply. The good news is that by 2020, if the current halt continues, the entire gig will be up…. That does not matter. What matters is getting in place more taxes, more regulations and funneling off more wealth. With CAGW however they missed the boat in 2009 and with luck, cooling weather and the disintegration of the EU’s economy the window of opportunity has closed. The International Monetary Fund answered that question. ….Within many countries the dramatic divergence between the top 1 percent and the rest is a new reality. The increased share of the top 1 percent is clear in the United States and in some English-speaking countries and, to a lesser degree, in China and India…. This new divergence in income distribution may not always imply greater national inequality in all parts of a national distribution. It does, however, represent a concentration of income and, through income, of potential political influence at the very top, which may spur ever greater concentration of income. The factors—technological, fiscal, financial, and political—that led to this dynamic are still at work. …And the euro area crisis and its accompanying austerity policies will likely lead to further inequality in Europe as budget constraints curtail social expenditures while the mobility of capital and the highly skilled make it difficult to effectively increase taxes on the wealthiest…. From Pascal Lamy, just retired Director-general of the World Trade Organization. …..climate change negotiations are not just about the global environment but global economics as well — the way that technology, costs and growth are to be distributed and shared…. Can we balance the need for a sustainable planet with the need to provide billions with decent living standards? Can we do that without questioning radically the Western way of life? The poor get poorer, the rich get richer and the middle class disappears. Btw. there are no sponsors, advertising or any other commercial value in my website, except a jumbled mess, as anyone venturing beyond front page may have found. Doesn’t Lovejoy defeat his own argument here? He is making up his own opinions (unproven theory) about ocean heat that can’t even be measured. Shouldn’t he keep the debate in scientific arena based on his own reasoning? This blog post, like virtually all other efforts dealing with “abrupt climate change”, conflates a geological catastrophe with a socioeconomic catastrophe. But a geological catastrophe does not necessarily a socioeconomic catastrophe make, unless society is immobilized…. And Ironically that is EXACTLY what Agenda 21 – Transit Villages do, make it that much harder to deal with catastrophe by restricting movement, transportation and energy. Sandy and Katrina are excellent examples of how politicians can really muck-up the works when it comes to dealing with catastrophes. Peter Gleick drills down the IPCC panel report’s findings on water: What does the IPCC say about water? Peter Gleick runs down some of the key water-related findings for precipitation, evaporation, glaciers, ice mass, and more here: What does the 2013 IPCC Summary Say About Water? Thanks for the comment. Here, I’ve just laid out the original language (with the description/definitions used by the IPCC). I agree that they could be clearer and more consistent in their communications. Sigh. A wasted useless exercise , since their temperature forecast is never going to occur. Seriously? Sea level rise didn’t even make it into that table? Shouldn’t they also include as an offset the high impact low probability risk of the start of the next ice age and the positive value of mitigating against the temperature drop? This is the ‘Precautionary Principle’, of course, that rhetorical excuse for people who can’t put a decent real reason together. The thing that will undermine them is that, having accepted the idea that highly unlikely things which might cause major damage are not only confined to climate change. A large meteorite is a classic example. Other ‘unlikely but possible’ thoughts include a major series of earthquakes caused by a volcano in the middle of Times Square, the world being caught in the ‘high radiation’ pulse from an exploding supernova, a disease killing off all plants in the world, or the world’s intelligentsia and politicians all suddenly going mad at once (See Charles MacKay) and splurging the entire GDP of every country of an insane attempt to live without energy. It is a work of fiction so you do not want to include any reality that might wake-up the Sheeple. So, why are we paying attention to GW at all? Because we are consciously denying clean water and basic sanitation to 100′s of millions of the poorest peoples on the basis of this idiotic premise. Well if they keep talking about it being ‘the greatest moral challenge of our times” then they can continue making huge profits by doing things like turning food to fuel while the world goes hungry. 870 million people are hungry. Every year, 1.5 million people die from hunger, including 16,000 children. That’s one child every five seconds. And the Administration through the EPA is demanding more corn be fed to vehicles. The cropland wasted feeding cars could be providing food reducing world prices and saving lives. They don’t care money and power win out every time. The new “baby ice” is very thin. There’s a big polar storm brewing up there, smashing up all that new ice. This causes a dip in the “extent” graphs. There is no sneaky “adjustment” behind the graph’s “dip” that I know of. (IMHO ice actually insulates the water, and the more open water you have after the midnight sun sets up there, and the longer that open water is kept ice free, the more the Arctic Sea is chilled right down to a depth of 400 feet, and the colder it will be up there next summer. In other words, “extent” is a lousy measure of whether it is cooling or warming, especially after the polar sunset.) 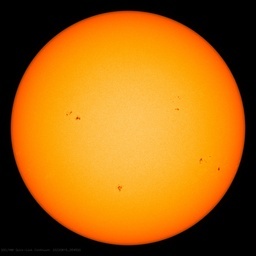 (I’m keeping a layman’s diary of the ice-melt and refreeze at: http://sunriseswansong.wordpress.com/2013/09/19/arctic-sea-ice-minimum-the-darkness-decends/ ) Now let’s get back on topic. Good try but it is only the NERSC sites that are showing the dip. Danish, Japanese and US sites don’t show it. I wonder what the damage from cooling will be when reality strikes. didnt the German climate scientist that came up with the 2 degree C target come out and say that he basically pulled that number out of a hat? The above is a classic example of the “science on the hoof, or let us keep alive the premise of AGW by making the facts fit our theory”. Heat trapped by CO2 cannot warm the oceans significantly, water is an extremely poor conductor of heat, heat trapped by CO2 is not radiative either, heat radiation will warm water but not very efficiently. Convection is the main and most efficient way for heat to transfer through water. Any heat trapped by CO2 is only going to warm the surface of the oceans, resulting in increased evaporation which will remove most of this energy. Warming the top inch of water is not going to result in convection currents going several miles deep! How can oceans “selectively” take up heat? If the ice caps are melting as the warmists state then the oceans should be cooling. If the oceans are warming why has there been a decrease in the incidence of hurricanes and tropical storms? Why have the Met Office predicted that here in the UK “snow will be a rare and exciting event” up until this year when after four cold very snowy winters, this prediction changes to the very opposite? The world will get warmer except for the UK in winter which will get colder and have more snow! Where are all the climate refugees from Africa and Southern Europe, Central America and Mexico that we were promised would be migrating northwards? The governments of the world will be barking mad to spend £trillions on fighting a problem that at its worst, will cause the worlds temperature to rise by less than a degree Celsius, based on beliefs and certainly not science! Assume our prediction of 2002 is correct and Earth is cooler by 2020. Based on the past scams of the IPCC et al, the agreement be declared an instant success! Score 1 for the IPCC! Yes, the AGW meme leads to mass death from starvation, thanks to the ethanol program, and also from hypothermia, thanks to carbon taxes. It is truly a new Holocaust, with a whole new set of Holocaust deniers. These crimes need to be as widely publicized as possible, and names need to be named as to who is responsible. Let’s also keep in mind that the deaths are not an unintended consequence of AGW-driven policies, any more than the Nazi slaughter of the Jews was an unintended consequence – they fit perfectly the Malthusian and otherwise anti-human mindset of the AGW crowd. don’t under-estimate their bureaucratic malevolence. That little sucker in brackets can mean whatever they want it to whenever “anticipate” persistence. I find that text as reassuring as a cop having the right to shoot or tazer me if I threaten him (or if he anticipates that I may do). An audio short circuit will cause a runaway volume increase capable causing serious damage to equipment e/o the ears. A mental short circuit may cause mental trauma, as the emotional energy is not channeled in a healthy way outward but is short-circuited onto itself causing a mental breakdown. After reading this post I suspect a substantial part of the CAGW hysteria is cause by a mental short circuit. The CAGW crowd are mainly busy with their own ideas, only listening to themselves, cut-off from reality, spinning all kind of subtle regulations and ideas about something that is non-existent. If this analysis is correct, the CAGW hysteria will inevitably implode and collapse on itself. We will see. I was taught that to calculate the cost of a probabilistic event, one multiplied the cost of the event should it occur by its probability of happening (i.e. its risk) to obtain the “expected value.” I am not aware of a mathematical derivation to support this operation, but, intuitively, it seems to make sense. I question, however, the mathematical validity of multiplying very large cost numbers (of catastrophic, but unlikely events) by these event’s inherently very small risk factors, as small differences in either the guesstimated cost or the guesstimated risk can make large differences in the “expected value.” I think you enter a realm of statistical chaos, not unlike that of the butterfly flapping its wings, where small changes in initial values can result in large changes in the outcomes of simulations. I would restrict this type of “expected value” analysis to events whose risk is within 2 sigmas of the mean, or, at most, no more than 3 sigmas (i.e. I don’t think that you can validly calculate the “expected value” for risks that are smaller than .05 or at most .01). Beyond that, I would suggest one would be in a statistical twilight zone. Let’s consider the late 20th c. warming. It lasted form about 1974 to 1998 , that could be considered to qualify as “a few” decades. In 2000 it was strongly “anticipated to persist for at least a few decades” . Centuries in fact. The fact that their ‘anticipations’ were unfounded does not alter the fact it had already qualified in 2000 as being “rapid and irreversible”. To hell with what climate really does in the next five or ten years that change is officially “irreversible”. They also need to consider the effect of diverting those trillions away from other disaster prevention efforts like the possibility of super flu, nuclear war, an airborne aids virus or cancer or other disease treatments. Imagine that slight chance that one researcher but no others would cure alzheimers but his funding gets diverted to global warming. Also we had cuddly Professor Brian Cox starting his new BBC series last night by explaining how funding science leads to targeted science which is not necessarily a good thing. Cox has always been careful about professing climate change, I presumed he was enjoying his new celebrity and did not want to do a Bellamy. I learned that it was some chap called Perkins who discovered the Azo-dies in 1870 while trying to make quinine. I always enjoy learning new stuff. Based upon historical records describing past periods of climate cooling, the following happens to humans: mass migrations causing wars and conflicts; mass starvation and epidemics; mass destruction and death from flooding. Empires decline, and nations fall, and are replaced by cruel and brutal regimes. But sea levels do fall, if there is an upside to climate cooling, and if falling sea levels are anything positive. We really do not know what will happen when a major glaciation period comes when global temperatures drop by 8 to 12 degrees C, but I imagine that human population will decline significantly and that civilization as we know it, will transform into something less palatable than we now have. Lukewarmers (the majority of skeptics) do not generally hold dogmatic views that anthropogenic global warming (AGW) could never cause small-scale or medium-term changes capable of causing minor disruptions in existing systems. 1. Whether “lukewarmers” are a majority is irrelevant, unscientific, pseudo-argument. 2. It is most certainly not “dogmatic” to hold the view that the unmeasurable (so far, anyway) human impact on any “global warming” cannot cause any “minor disruptions” of any significance. Au contraire, such a view simply acknowledges the reality that there is no evidence that humans have any significant impact on the climate of the earth. We have no historical precedent for catastropic warming damaging human society, but we do have historical accounts as to what even a 2 degree C drop will do from the Little Ice Age and the cooling period inbetween the Roman Warm Period and the Medieval Warm Period. As for the reality of a major glaciation period coming, unless this present Ice Age in which we live has ended, which it has not, the consequences will be devastating to us. Human civilization was born during the Holocene Optimum period when it was much warmer than it is today. William: Reason and logic are lost during periods of a mania. Reality however does not change just because it is ignored. When a person considers buying insurance (David Cameron’s useful analogue) for anything, the yearly cost of the insurance and what the insurance covers is considered. People make their decision to purchase insurance based on facts and logic. People would not pay a yearly insurance premium that was half the value of their house, to insurance their house against the possibility of nuclear war or a massive solar flare. That would be idiotic, irrational, and absurd. Cost is part of equation, what the insurance covers, the likelihood of actually collecting on the insurance, and the realistic likelihood that the event will occur are all considered. Do any of those arguing the IPCC’s position (catastrophic AGW, CAGW) dispute that? How much is the war on CO2 emissions going to cost and how will fighting that war affect the general public? The developing countries have spent $2 trillion dollars on greens scams that are comically ineffective (comical if your idea of comedy is massive deficits and extraordinary high energy costs for little benefit). The unintentional consequences and the limitations of the green scams (biofuels, wind power, and solar) are being hid in the mania as is the schemes actual reduction in CO2 emissions. Green energy is green wash. Countries and taxpayers have limited funds to spend on everything. Engineering facts such as intermediate power sources require power storage to significantly reduce CO2 emissions do not go away just because they are ignored. Higher energy costs are a type of taxation. There are no engineering or economic magic wands. The US conversion of 40% of the US corn crop to ethanol is a great example of a scheme’s problems; there is almost no net reduction in CO2 emissions to convert corn to ethanol if honest accounting is done, taking into account all energy inputs. Ignoring that fact, the big picture issue for all of the biofuel scams is as they require agriculture land, there is no surplus agriculture land, and people still need to eat (providing all transportation fuel from biofuel for the western countries would require roughly the entire world’s current agriculture land) biofuel has and will require that virgin forests be cut down. Ironically loss of habitat is the single most important factor for extinction of land based wild life. There will be food wars and mass extinction wild life if the biofuel scam is not stopped. That is madness. The developing world is developing. Developing requires energy. Small very, very, very, expensive reductions in CO2 emission in the developing world are not even sufficient to stop the rise in world CO2 emission. Green scam energy will never stop the increase in world CO2 emissions. It does not work. Ignoring that fact does not change that fact. The only viable energy policy change that has a chance of significant reduction in world CO2 emission (assuming that is what an informed public wants to do) is a massive conversion to nuclear power along with a war time like reduction in standard of life (end of air travel for tourism for example) and the threat of actual military action to get world compliance for the war on CO2 emissions. That is the big picture cost of the war on CO2 emissions. Massive investment in green wash in response to endless propaganda will not significantly reduce CO2 emissions in the developing world and has no chance of stopping the increase in world CO2 emissions. What would the public’s reaction be if they are told that they will be required to make wartime like sacrifices in their standard of life and two or three new nuclear reactors will need to be placed in service every week for twenty or thirty years, to fight the war on CO2 emissions? The reaction would be hold on, let’s re-look at what we are trying to protect against. Question: Does anyone writing in this forum dispute the above? Is there is a CAGW straight shooter in the house? Note James Hansen states over and over that nuclear power is the only viable option to fight the war on CO2 emissions, as do a number of prominent CAGW environmentalists and top academics. The analysis for B and C changes if A is reality. B) Risks and benefits of increased CO2 and lukewarm warming Vs the same for higher warming. C) Scientific evidence to support lukewarm warming LAGW Vs CAGW. Thankyou for your excellent post at October 3, 2013 at 12:23 pm. Clear, succinct, and accurate. Thankyou. Wow. Here I was, just hoping someone might acknowledge my post. You are so kind and generous to tell me that. That quote really irked me. If you can say, how is your friend you were worried about (cancer scare) about 3 weeks ago? I’ve been praying. I hope all is well. And with you, too. That is correct, but it is also necessary to do the same calculation on all branches of the probability and decision tree. The Expected Value of a 10 km asteroid impacting the Earth is one “astronomical” cost times a 100-million to on1 probability and it is definitely a big negative number. On the other hand, almost any action we undertake on the decision tree arrives at the same big negative number MINUS the cost of the impotent action, resulting is a bigger negative number than doing nothing. Stephen Rasey (at 12:45pm) — Well said. Applause. If you can say, how is your friend you were worried about (cancer scare) about 3 weeks ago? I’ve been praying. She needs 24 hour care. A District Nurse visits twice a day to aid washing etc. but a rota has been established for her full-time care. I drive up there tomorrow to do my stint so will probably not have time to come here again until the middle of next week. Sincere thanks for your remembering her. “Let us stipulate that as long as you have two feet, you run the low probability, high impact risk of stepping off a curb and getting hit by a bus. This is indeed a very negative event to be avoided. I apologize for not saying this explicitly. You are, of course, correct. Thank you for stating this point so clearly. Even 5% of one of these events is a very large number…. We have already had a taste in 2008 with food riots in 60 countries. You can then add in the deaths in the UK from fuel poverty. About 2,000 extra deaths were registered in just the first two weeks of March compared with the average for the same period over the past five years. Depending on the slant you get One in four households suffer from fuel poverty in the UK. The only questions are how soon and if cooling will strike, how deep and long the cooling is and how angry people become over being mislead. The power grids in the EU and the USA have been weakened enough that a prolonged cold snap, especially with ice could be devastating. A bad cold snap after planting season, drought or a cold wet nasty harvest in several areas around the globe would also be devastating because we no longer have a strategic grain reserve. In the USA you also have the unknown results of the Food Safety Modernization Act as it kicks in and farmers sellout to developers, switch to biofuel/forest products or drop out of commercial food production entirely. There is a lot of nasty stuff going on behind the scenes concerning the food supply that most people are unaware of and could come back to bite us. Who’s controlling the global food supply? Dear Richard, good for you. I’ll keep on praying. Stephen Rasey! Aaack! Great analogy for what Doctor Dope is prescribing for the U.S. economy, though. Phil — You were just fine — (You: “differences in either the guesstimated cost or the guesstimated risk can make large differences in the “expected value.”) — you had the cost – benefit ratio in there, you were just more verbose, multiplying your enthusiasm, which is not a bad thing, per se. And you are obviously pretty cool. Not many WUWT posters respond to a semi-correction as graciously as you. FYI — you might consider embellishing your fine name (there is a real creep calling “himself” “Phil.” who regularly posts, here. I nearly skipped over your post, thinking you were he (what he writes is virtually always intentional mischaracterization of another’s post and/or speculation smothered in copious quantities of greasy arrogance). Straw man argument. Also, it’s absurd, and unscientific to say that AGW (which has never actually been shown) could cause some future event, much less could never cause one. Whatever effect man has had on climate to date appears to be so small as to be of no concern whatsoever. Instead of worrying about that pebble of AGW rolling towards us, we should instead concern ourselves with the boulder of natural cooling. Because they thought that would allow them to take over the world. How about this one? Taking measures to prevent conjectured human-caused global warming is like pausing on your front porch to take off your red shoes just in case they make Weather Wolves angry instead of stepping inside your house and closing the front door to keep the Weather Wolf racing across your lawn from killing you. Matt S (at 1:56pm). Precisely. Way to cut to the dark, cold, heart of the matter. The “terminally dense” may need more than just one “/sarc”. so…..they kinda sorta maybe think the Arctic might be ice free in some summer…. Calling 1 million sq k “ice free” is like saying the dog only has a few fleas…. Stephen Rasey — ““Let us stipulate that as long as you have two feet, you run the low probability, high impact risk of stepping off a curb and getting hit by a bus. This is indeed a very negative event to be avoided. Brilliant and worth a good chuckle. Well played. The trend shown in this graph for 2013′s re-freeze is a thing of beauty! Please note that 1,000,000 sq km of ice (whether “extents” or “area” will be polished over the minute the CAGW press can declare ‘The Arctic is ice free!! !” ) corresponds to the Arctic area between 85 degrees north latitude and the pole! Quite a large amount of sea ice that would remain, would it not? 2. But, most importantly, from mid-August through the minimum sea ice extents at the equinox (Sept 22) about 5 weeks later, every sq meter of sea water exposed by the “catastrophically melted sea ice” is losing more heat energy by long wave radiation out, evaporation, convection, and conduction through the 24 hours of every day that water is exposed to the air than it can absorb by sunlight. This is because at these very low solar elevation angles at this time of the year, there is actually a very, very small difference in albedo of open water and the typically dirty sea ice actually present in June, July, and August to direct solar radiation. If cloudy, there is no direct solar radiation of course, but then again, if it is cloudy, then only 30 – 33% of the potential inbound solar radiation can get through the clouds to be absorbed. However, after a very benign start, it is true that incremental welfare losses do begin to appear after temperatures have risen about 2°C from 1850 levels. Do you mean it is true that Tol projects incremental welfare losses about about 2°C from 1850 levels? Or do you mean that it is true that incremental welfare losses do begin to appear after temperatures have risen about 2°C from 1850 levels? I have wondered about the 3 previous interglacials, which looked like they were warmer than the Holocene by an average of over 2°C. Will 2.5°C mean the destruction of the biosphere? Was there widespread desertification? Did the biosphere thrive? Here are what some warm periods did to some tropical places. I have been told that AGW is supposed to make its presence felt mostly in the higher latitudes. The climate is complex and jam packed with uncertainties. Economic models sometimes have a hit and miss record. What happens when we use economic models determined by the failed climate models? Success!!!! We are saved. Pump out your carbon dioxide, the Earth can handle it. Don’t trust in models, trust in PAST observations with heat and vibrant vegetation – the ultimate sustenance of vertebrates. What a crock. Is this a sign of abrupt climate change? Is this a sign of the Arctic Death Spiral? Is this a sign of Catastrophic Global Warming? I’m speechless – the only “science” with even less ability to predict future events than climatology is economics. (I say this as one with an economics degree.) Find an economist who can accurately predict the global economy for just three years running and then I might believe his estimates of damage decades in the future. What if every author of the IPCC AR5 report was given a custom built greenhouse in their backyard. $50 million would go to the first one to grow ready to harvest tomatoes. They have the choice of pumping in 400ppm or 700ppm of carbon dioxide. Would there be a consensus? What do you think most of them would pump: 400ppm or 700ppm of carbon dioxide? The prize money could be kept for themselves or to go to the underwaters islanders in the Maldives. Why is it that when I look at an image of the planet Earth that most of the greenery is most intense around the equator and diminishes as I look north and south? Is it because most vegetation abhors warmth? Why is it that there has been a greening of arid areas in recent decades? Do observations matter? It will take approx. one year from now the solar cycle will inevitably leave the peak period. Since then the surface temperature anomalies will start to consistently decline and render the slight downward temperature trend we see now for more than decade significant in just about half decade – no matter what anybody does or thinks, what talking points chooses or what likely or unlikely impacts binds with the presumed warming. It is beyond human cappabilities, no matter what political power has anybody who would like to do it, to significantly warm surface of our planet for purpose. Therefore the probability of any binding treaty to mitigate global warming coming into force by 2020 is close to zero – it wasn’t ratified, nor even adopted by 2009, when the warming stall was still less than decade long and statistically unsignificant, so it is even less likely such treaty will be adopted, ratified and coming into force in years when the non-dependence of the surface temperatures on the atmospheric CO2 content rise will become more and more apparent. Some how it seems really perverted to be praying for really nasty cold freezing weather and advancing glaciers when we know it is bad news for mankind. Re: red shoes — I was thinking (and should have written) running shoes. Dorothy’s ruby slippers are a neat twist. They, unlike human CO2, were powerful, heh. Well, here’s a “Wizard of Oz”-inspired analogy: the wicked witch, high priestess of the AGW Cult, is destroyed by –> water (as in, AGW lies and speculation are dead due to the truth about the ENSO ocean water driver’s power). Keep dousing those witches with the truth about the oceans, Bob Tisdale! Hey, Tume, I agree. That somewhere-over-the-rainbow proposed treaty died on the starting line; all that remains is to get a few big guys to run over and push that old jalopy off the track, out of the way of cars that actually go. Picky, picky, picky. The trouble with you just don’t want to be doomed. Is that stated correctly? What does it mean? And it is. I sense a serious lack of commitment to doom. 16,000 children a year is one child every 19,710 seconds. Roughly. 1.5 million people a year is one person about every 210 seconds. M. Simon, thank you for reminding us all of a REAL problem we need to try to solve. I was pointing out that even real problems have their exaggerators. “Human and natural influences on the changing thermal structure of the atmosphere,” Proceedings of the National Academy of Sciences, Sept. 16, 2013. Interesting. I have always assumed that the “re-blogged” posts were a courtesy intended to confirm attribution and which tacitly honored the Creative Commons principles. It didn’t occur to me that they could be posted for ulterior motive. Frankly, I can’t think that it would work – I have never personally followed one of those re-blog links since I already read the original, after all.